PASSWORD_PLACEHOLDER is very useful when your users are already in WordPress, and if you’d like your users to use the same password going forward. This can be used when you are converting from Wishlist or any any other membership plugin and don’t want to change the user’s password when you switch. This function will basically copy your user’s WordPress password into Infusionsoft’s password field. You will first need to import all your users to Infusionsoft. Once your users are imported to Infusionsoft, you can do a bulk update of your Infusionsoft password field to “PASSWORD_PLACEHOLDER” (without quotes). You can find a detailed tutorial on how to do a bulk update in Infusionsoft from here. Once the customer logs in successfully to your WordPress site, the encrypted WordPress password will be copied over to the Password field in Infusionsoft (unencrypted) where the PASSWORD_PLACEHOLDER was previously located. 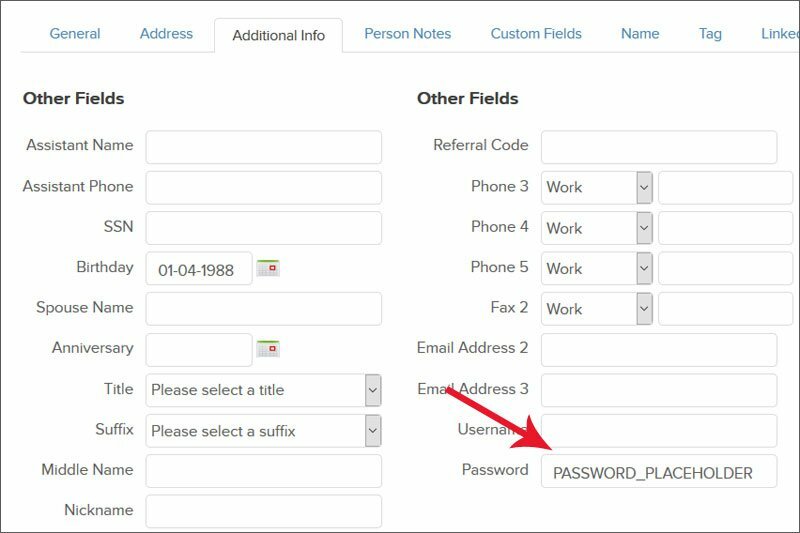 Use PASSWORD_PLACEHOLDER only for those users who exist in WordPress and you’re looking to have their passwords synced to Infusionsoft. For other users, we’d suggest you to use the Password generator HTTP post.